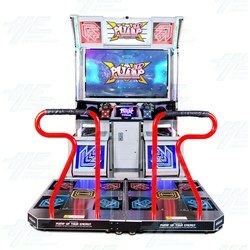 Pump It Up 20th Anniversary Edition is the newest Pump It Up game and comes in Andamiro's LX cabinets. These cabinets include a giant 55" display screen to allow the HD graphics to pop, along with a wall of sound provided through 4 speakers and 2 subwoofers. The new brillant light show is sure to upgrade any location and build revenue and player loyalty with A.M. PASS card (PIU Login). The new software package comes with multiple upgrades including new user interfaces, new songs, worldwide game play, new charaters and linking with previous machines. The new Pump It Up 20th Anniversary game is also available in upgrade kits for cabinet versions FX (42”), CX (43”) and TX (55”), along with the current LX (55”). Pump It Up 20th Anniversary Edition also comes in 2 different kinds of bill boards. There is a white verion and a black version for players to choose from.